*Update -- this dress has sold! Thank you! I should have more dresses over the next week! I looooove a sweet little yellow dress for the summer! But there's only one problem . . . this dress isn't in Mimi's size. It's a bit small -- a size 3. Sorry, Meemers. So this little ray of sunshine is a size 3 and is $35.00 ($4.00 shipping). A view of the bright red button and blue tab at the back of the ruffled collar. Although the dress is a little too short for Mimi (who is a size 4 or 5), it should give you hope that your little size 3 can get at least two summers out of this one! The length of the dress from the top of the ruffle in the back to the bottom is 21". Also, the dress is fully lined. Now for some twirling action . . . 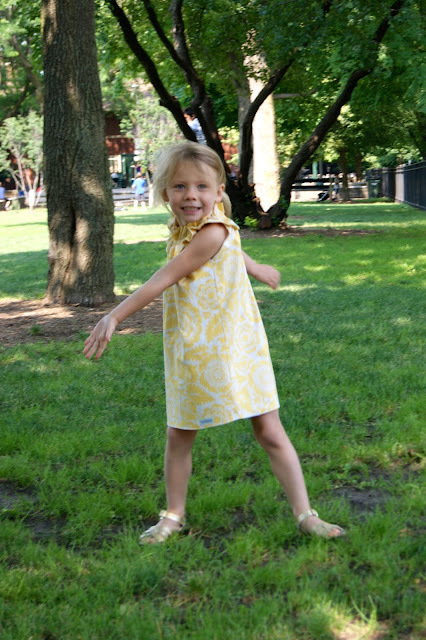 If you want this pretty little size 3 Sunshine Dress, please e-mail me at mimiandmack@yahoo.com. It is $35 (plus $4.00 shipping if you aren't in Chicago).